Tell me about Dine With a Prof/ Coffee With a Prof! For Dine With a Prof and Coffee With a Prof, you will find more information at this website. Early in the quarter, you can usually assume vouchers are still available, but later in the quarter, it’s a good idea to call Janet Lim in Revelle’s Administration Building to check: 858-534-3493. Step 2: Send an email to confirm location and times! Professors are generally-speaking thrilled to meet with students and get free coffee/food, so don’t be nervous about rejection. 🙂 The website has a great email template you can feel free to use. Step 3: Visit Janet Lim in person at the Revelle Administration Building (hidden out by Galbraith and York halls) to pick up a voucher for the location, time, and professor you’ll be meeting. If you’re worried about running out of things to talk about, (1) remember that this person is a professor, i.e. loves talking about their research and/or with interested students, and (2) you can check the website for ideas of conversation starters. I’m looking for research/internships/opportunities. Where do I start? If you want advice from UCSD Alumni about their career paths, opportunities they took, etc., check out the Alumni Advisor Network. What’s the best place to eat on campus? **The above are merely opinions, but they do represent a range of students living on campus (Revelle, ERC, etc) and off campus. What’s the best way to get to the beach? 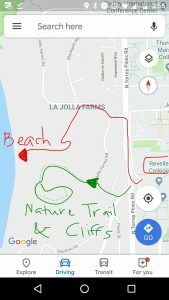 If you really want to put your toes in the sand, follow the red line from Revelle, north on N Torrey Pines, left through the sketchy alley onto La Jolla Farms, then take a right and walk until you see the entrance to the trail on your left. This path is walking only (no cars), and it’s very steep, but it will take you all the way down to the actual sand of Black’s Beach. A couple words of caution: (1) Realize as you walk down that it will be equally steep going back up. I know this sounds obvious. It is still worth saying. You will still get to the bottom and then contemplate living on the beach forever because you don’t want to walk back up. 🙂 (2) There’s a nudist beach somewhere further north along Black’s Beach, so venture northward with caution! If you’re just looking for a view of the ocean and actually walking down the cliffs sounds too intense, follow the green line from Revelle, get to the intersection of N Torrey Pines and La Jolla Shores, walk down La Jolla Shores away from campus, turn right onto La Jolla Farms, and walk a very short distance until you see the Scripps Coastal Reserve Biodiversity Trail on your left. This is a beautiful trail and it goes in a loop, so if you just want to be near the ocean and nature without going too far, this is the spot. Perfect place to watch the sunset. Be aware, though, that they close this trail at dark. Can I drop out of housing at any time? Housing, Dining, and Hospitality (HDH) tends to be the bane of everyone’s existence here at UCSD, but there are human beings in this machine who genuinely want to help you. As a general rule, if you find yourself needing to deal with them, let me know and I will gladly make the phone calls and pull the strings for you. I dealt with this nightmare myself as a freshman, and I really don’t wish it on anyone else. Where can I find more accurate Google Maps directions for classes? Oh, I wish. Google Maps is the best I have been able to find for mostly accurate predictions of how to navigate around campus and how long various routes will take. Of course, the more time you spend on campus, the better you will be at finding shortcuts and outsmarting Google Maps. I recommend wandering between classes as much as you can, time allowing. The more you wander around, the more complete your mental map of UCSD will become. Are there any secret spots or gardens that are good to study in? Do you have any information about Study Abroad? There is a wealth of information about Study Abroad available through people and online! I have friends who have done Study Abroad over the summer, for a quarter, and even for a whole year. If you want to hear from them, ask me for their contact info! The best person to contact is Rachel Finerman, my good friend who now works for the Study Abroad office. She’ll be an awesome resource for any of you interested in learning more, so let me know if you’d like her contact info. In general, you can visit studyabroad.ucsd.edu to learn more about Study Abroad at UCSD. There are tons of options available, including options to study in Sacramento and Washington DC, in case actually leaving the country isn’t quite what you’re looking for. If you’re thinking of going abroad specifically this summer, you can use this link to explore programs. Have fun checking out all the cool options! And as a final note, make sure you touch base with Revelle College Academic Advising before you commit to Study Abroad to make sure it works with your 3- or 4-year-plan. Can I participate in sports even if I’ve never played before? Check out UCSD Recreation for a bazillion opportunities to get involved with sports and other activities, regardless of previous skill level. The amount of options under tabs like “Programs and Classes” or “Adventures” is overwhelming me as I research this for you, which is a great sign! And that’s not even looking at the options under “Competititive Sports.” 🙂 So just take some time to explore this website, ask friends if they have gotten involved or if they’d like to get involved with you, and go for it! Good luck! What’s the best way to manage time? How do you survive the HUM series? Short answer: You will survive. Everyone does. There are resources available to you, and you will be just fine. Deep breaths. Long answer: There is much to be said on this topic. Come to Discussion Section Week 4 or any of my Office Hours to hear my extended thoughts on this topic. How do you deal with the fear of missing out? Um. You don’t? I’m going to tackle this one in Discussion Section Week 4 as well, and again, you can come to any of my Office Hours to hear my extended thoughts on this topic.